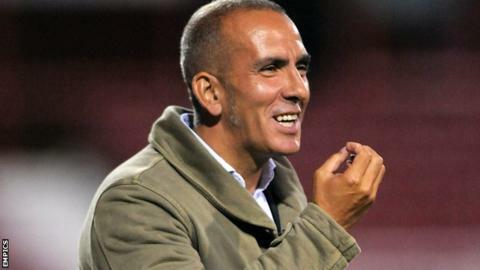 Swindon boss Paolo Di Canio said he was willing to spend £30,000 of his own money to keep loan players at the club. A deal for Tottenham's John Bostock has expired, but Norwich's Chris Martin has re-signed for 28 days and Charlton's Danny Hollands is expected to sign soon. His second loan spell from Tottenham ran until 7 January. The 20-year-old has made six starts and three substitute appearances this season. Martin's deal expired at the weekend after first joining on loan on 15 November, but his stay was extended for a further 28 days on 7 January. Martin has failed to score in eight games. His loan at Swindon from Charlton ended on 5 January after he scored twice in eight games. Di Canio was told by Robins chairman Sir William Patey he would not be given extra funds in January. "I will put my own money in to keep them," said the Town boss. "I will spend £20,000 or £30,000 and put my money in to keep them for as long as we can, because I care and I want to win. I'm sure with them we have more chance to win." Following his appointment in May 2010, Di Canio was given free rein by then chairman Jeremy Wray to add to the Swindon squad and his re-shuffle last season paid off, as he led them back to League One as champions at the first time of asking. He continued to strengthen his pack over the summer - signing 14 players - but his excessive spending led to the club breaking Football League regulations, and they were subsequently hit by a transfer embargo. The sanctions were lifted a month later but Patey, who replaced Wray in October, has since insisted no new funds will be offered to Di Canio to help maintain their push of back-to-back promotions. "I'm not going to start selling my houses in Italy, but I want to keep those players," Di Canio told BBC Radio Wiltshire. Meanwhile, Di Canio confirmed the sale of former captain Paul Caddis to Birmingham had broken down after the cash-strapped Championship side said they were unable to buy the defender out of his Swindon contract. Caddis was loaned to the Blues at the start of the season, with striker Adam Rooney going the other way, after the Scotsman fell out with the Town manager. Both parties had hoped to make the deal permanent in the summer but Di Canio revealed: "We agreed a deal for an amount of money but in the end they said 'we can't buy him now'. "He will stay there and we are happy to keep Rooney here until the end of the season, and then we will go to another plan."